With forty nights of pricey Japan looming before us, I wondered how in the world we wouldn’t break the bank on lodging on this island nation. Not only is lodging expensive, the bum deal is that you don’t get much for what you pay for (peace and quiet). We ended up with a healthy mixture of camping (in urban parks, the mountains and at expressway service areas), couchsurfing, and a few nights at both a capsule hotel and an internet cafe. 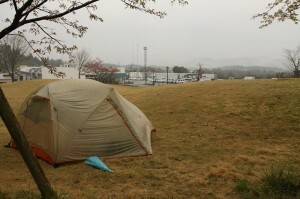 We spent our first night in Osaka camping under blossoming sakura trees in an urban park near Matt’s old apartment. There were two homeless individuals bunked up there for the night with makeshift box homes. Walking around Osaka, I was surprised to see a few homeless men sleeping in the middle of the day in more permanent looking box homes set up near busy shopping districts. 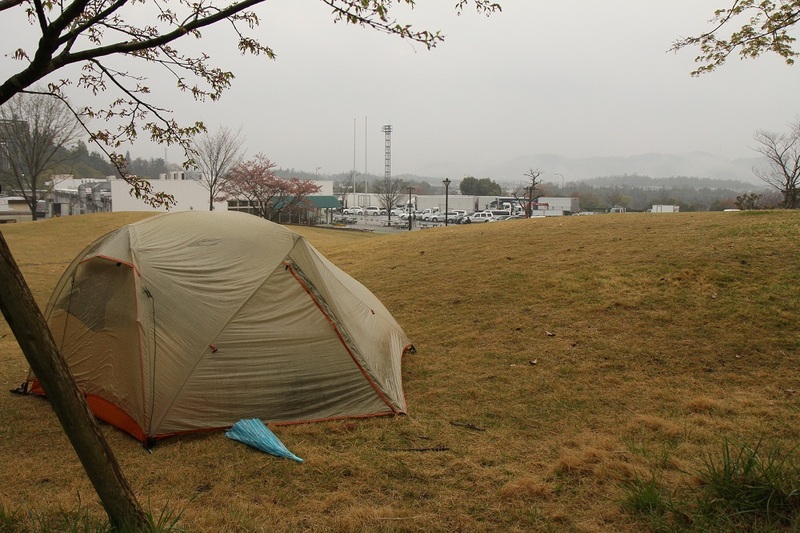 As far as we know, urban camping in Japan is not illegal. However, it’s highly suggested that you don’t stay in the same park for more than two nights in a row. So far we haven’t been hassled by anyone, even when we’ve camped at service areas like the one below. Part of the trick is setting up later at night and packing up early in the morning – lest you think we’re leading the luxurious life of sleeping in every day! 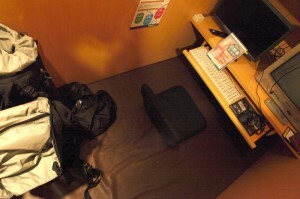 Staying in both the capsule hotel and internet cafe was a definite Japanese experience. The capsule is just big enough to crawl into. Some are equipped with tv’s and most have a consul so you can listen to music, adjust the lighting in your space, and set an alarm clock. The door pulls down and just like that you’re as snug as a bug in a rug. Matt was too tall for his but I was quite cozy and besides the occasional rustle of plastic as girls came and went throughout all hours of the weekend night – ugh, shopping bags – I was thankful for the dry and warm place to sleep. 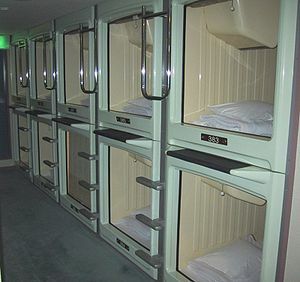 Capsule hotels are popular with businessmen and it was so strange to watch them come and go with their suits, ties, and briefcases. Like other countries, Japan has internet cafes. Unlike other countries, Japan has internet cafes that you can spend the night in. So crazy! 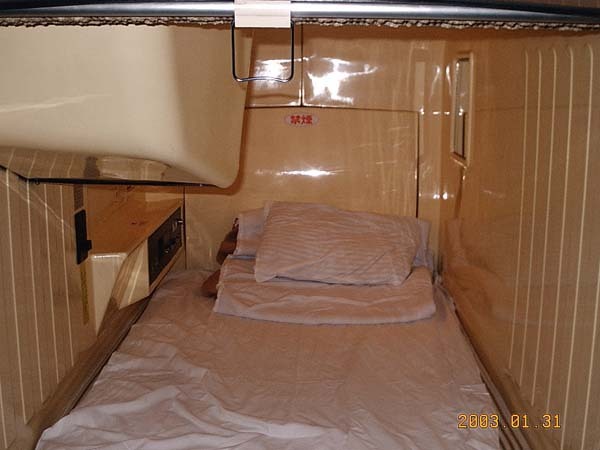 Like the capsule hotel, you were given your own small space. Instead of capsules, this was set up in cubes and if you stood up, you could look down upon the person next to you. Each cube contained a computer, tv, and beanbag. You were provided with a fleece blanket to stretch out on the cube’s floor as well as endless coffee and soft drinks. We went with the 12-hour package, which meant that when we checked in at 6pm – there were only two cubes left – we had to get out by 6 am the following morning. What an interesting concept! A cool experience, but I could have done without the belching men who’d had too many soft drinks. Written by: kate on May 2, 2012.on May 12, 2012.